London, 1865: Literally plucked from the street, Alice Wilding finds herself the silent audience to the most turbulent years of the life of bohemian artist, Dante Gabriel Rossetti. As his dumb muse, she witnesses infidelity, madness, forgery, lust, theft and death. 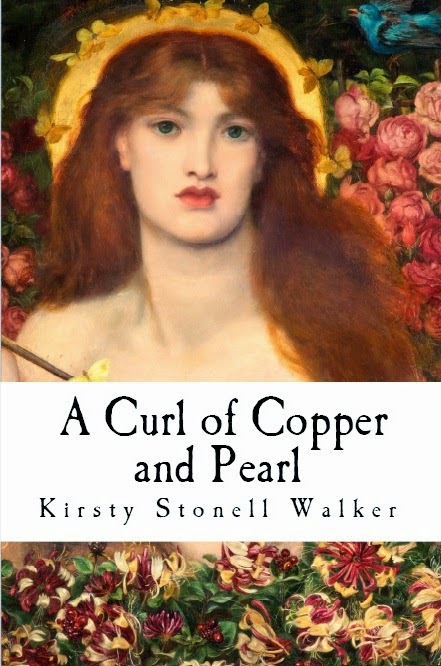 A Curl of Copper and Pearl is a memoir of the lives of others in a world where truth is reliant on who is painting the picture. If you are interested in Pre-Raphaelite lovelies, you'll love my novel, based on the life of Alexa Wilding. Covering the years 1865 to 1882, it follows Alexa as she experiences the madness, glory and beauty of Rossetti's circle as she sits for his paintings. Who is to be trusted and who will destroy her? Will Rossetti risk everything, including Alexa herself, in his pursuit of beauty? Buy it from Amazon here (UK) and here (US) or at your local branch!